Tracy McCartney in action in the Snowdonia Marathon. Winning a marathon once is hard, but winning it for a second time is even harder, as Tracy McCartney discovered upon her return to Snowdonia on Saturday, the scene of her 2015 triumph. Although unable to replicate her gold medal winning performance, the 39 year-old Nene Valley Harrier battled the mountains and a niggly hip to return to the podium with a third-place finish. Tracy Mccartney (right) on the Snowdinia Marathon podium. Such is the standing of the race that McCartney found herself surrounded by the Welsh press and TV crews pre-race, all of whom were eager to see if she could hold on to her hard won title. It was looking good for the Stilton-based athlete early on as she led through half way in a blistering 1:27.40, a minute ahead of her main rivals. Sadly for McCartney though her troublesome hip started playing up in the second half of the race as she encountered a series of steep ascents and descents. She was passed by two runners in the later stages, on one of the most challenging parts of the course. Despite this setback the mother-of-two battled her way through the last few miles taking the bronze medal in a time of 3:09.27, just 40 seconds down on her winning time from last year. McCartney was in ebullient form post race. She said: “I was working hard to maintain my 6:50 average as planned but my quad and hip had other ideas. “From mile 10 my quad started to hurt, the pain then travelled to my hip and glute. I persevered until mile 21 but dragging my quad up the two mile ascents was tough. Nene Valley teenager Jevan Robertson was also in action and declared himself “overjoyed” with his 3:26.16 clocking which placed him 143rd out of over 2,000 participants, all of whom were likely to have been more accustomed to the mountainous terrain than the Chatteris teenager. Another pair of Harriers were in marathon action at the weekend with Sean Beard clocking 3:11.34 in Frankfurt. The 51 year-old was restricted in his training by an injury and slowed in the last few miles of the race. 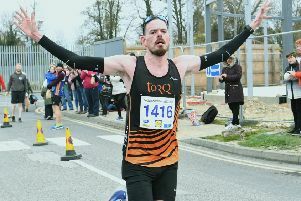 His time was still good enough to secure the Bretton postman automatic qualification for the London Marathon. Beard feels he has unfinished business over the distance, and will be aiming to beat his best time of 2:52.28 when he crosses the line in The Mall next April. Yolanda Gratton finished 13th lady in the arduous Beachy Head Marathon, which begins with a climb from Eastbourne to Beachy Head and crosses the downland behind the Seven Sisters cliffs in the later stages. The 42 year-old, who is married to former London Marathon winner Mike Gratton, completed the energy-sapping course in 3:55.00.